James Harden and Chris Paul combine for 58 points and 17 assists as the Rockets go above .500 for the first time this season with a 132-112 victory over the Kings. Jaren Jackson Jr. scores a career-high 27 points and Marc Gasol adds 19 with 15 rebounds to become the Grizzlies all-time leading rebounder, as Memphis slays the Sacramento Kings, 112-104. Blake Griffin finishes with 26 points, nine rebounds and seven assists as the Detroit Pistons get a road victory over the Sacramento Kings, 106-90. Zach Randolph passes to Josh Jackson as Jackson cuts to the basket for a layup. Despite going into overtime, the Kings hang on to beat the Miami Heat. De'Aaron Fox proved to be clutch, leading the team into overtime, while Zach Randolph was big in the game with 22 points, nine rebounds, and four assists. Justise Winslow goes to the rim and Zach Randolph swats the ball away. Zach Randolph shoots from the outside and gets nothing but net. Zach Randolph with the assist to Buddy Hield for the layup. Nikola Mirotic comes off the bench to score a game-high 26 points as the Pelicans defeat the Kings, 114-101. Damian Lillard leads all scoring with 26 points as the Trail Blazers get the win over the Kings, 116-99. Kentavious Caldwell-Pope racks up 34 points, including eight 3-pointers, to lead the Lakers to victory over the Kings. Zach Randolph notches a double-double with 29 points and 12 rebounds in the Kings loss to the Thunder. Russell Westbrook buries the game-winning three and notches his 18th triple-double of the season as he leads the Thunder to a 110-107 victory over the Kings. Zach Randolph drives through traffic and banks the layup. Zach Randolph drives his way inside for the and-one layup. Zach Randolph scores 22 points as the Sacramento Kings cruise to a 114-109 victory over the Dallas Mavericks. Zach Randolph drives to the rim and shows off his skills by finishing with a sweet left-handed hook shot. An early-entry candidate selected by the Portland Trail Blazers in the first round (19th overall) of the 2001 NBA Draft ... Signed a multi-year contract with the Portland Trail Blazers (8/20/01) ... Signed a multi-year contract extension with the Portland Trail Blazers (11/4/04) ... Traded by the Portland Trail Blazers with Dan Dickau and Fred Jones to the New York Knicks for Steve Francis and Channing Frye (6/28/07) ... Traded by the New York Knicks with Mardy Collins to the Los Angeles Clippers for Cuttino Mobley and Tim Thomas (11/21/08) ... Traded by the Los Angeles Clippers to the Memphis Grizzlies for Quentin Richardson (7/17/09) ... Signed a multi-year contract extension with the Memphis Grizzlies (4/20/11) ... Exercised a player option to extend his contract (6/27/14) ... Signed a multi-year extension with the Memphis Grizzlies (6/30/14) ... Signed a multi-year contract with the Kings (7/10/17). Averaging 16.8 ppg (.471 FG%, .254 3pt%, .763 FT%), 9.3 rpg, 1.8 apg, 0.7 spg, 0.3 bpg and 31.3 mpg in 1,057 games career games (825 starts) in his 16 NBA seasons with four teams: Portland (2001-02--2006- 07), New York (2007-08, 2008-09), Los Angeles Clippers (2008-09) and Memphis Grizzlies (2009-10--2016-17) ... Owns 480 career double-doubles (third among active players behind only Dwight Howard and Pau Gasol) and one triple-double (3/19/16) ... Averaged at least 20 points and 10 rebounds in five different seasons ... Averaged at least 20 points and 10 rebounds in five different seasons (2003-04, 2006-07, 2008-09, 2009-10, 2010-11) ... The Grizzlies franchise career leader in field goals made (3,731), offensive rebounds (1,895), defensive rebounds (3,717), total rebounds (5,612) and double-doubles (285) ... Has scored 10+ points 879 times, including 396 games with 20+ points, 50 games with 30+ points and three games with 40+ points. Selected to the 2010-11 All-NBA Third Team ... His selection to an All-NBA team marked a career first and a franchise first for the Grizzlies ... Two-time NBA All-Star (2010, 2013) ... Received the 2003-04 NBA Most Improved Player Award. Averaging 16.5 ppg (.437 FG%, .154 3pt%, .750 FT%), 9.3 rpg, 1.7 apg, 0.7 spg, 0.4 bpg and 35.0 mpg in 70 playoff games (64 starts) for Portland (2001-02, 2002-03) and Memphis (2010-11—2016-17) ... The Grizzlies’ all-time postseason leader in points (979), rebounds (540), rebounding average (9.6) and field goals made (372) ... Owns 29 career postseason double-doubles. Averaged 14.1 ppg (.449 FG%, .223 3pt%, .731 FT%), 8.2 rpg, 1.7 apg, 0.5 spg, 0.1 bpg and 24.5 mpg in 73 games (5 starts) ... As a starter, averaged 9.2 ppg (.446 FG%, .429 3pt%, .947 FT%), 3.3 rpg, 2.1 apg, 0.9 spg, 0.5 bpg and 28.5 mpg in 15 games ... As a reserve, averaged 7.7 ppg (.380 FG%, .363 3pt%, .729 FT%), 3.1 rpg, 1.8 apg, 0.8 spg, 0.5 bpg and 23.7 mpg in 58 games ... Missed a total of nine games ... Away from the team for seven games (11/25-12/5/16) due to personal reasons ... Did not play in one game due to a coach's decison (2/8/17) ... Inactive in one game due to rest (4/9/17) ... Led the Grizzlies in scoring five times, in rebounding 35 times, in steals 10 times, in blocks seven times and in minutes twice (all including ties) ... Became Michigan State Univeristy's all-time NBA leading scorer as he surpassed Magic Johnson (17,707) and put himself at 75th all-time with 17,721 career regular season points ... Reached 17,000 career points to become just the 12th player in NBA history to record 17,000 career points and 3,000 career offensive rebounds ... Notched 182 offensive boards to total 3,182 for his career, passing David Robinson (3,083) for 25th highest total in League history ... Surpassed Pau Gasol (3,324) as the Grizzlies franchise leader in field goals made with 3,731 field goals made in a Memphis uniform ... Set the Grizzlies single-season record with 54 double-figure scoring games off the bench previously held by Mike Miller and O.J. Mayo with 47 ... Recorded 19 double-figure rebounding games off the bench to set another club single-season record previously held by Michael Smith with 11 ... Scored in double figures 59 times, including 10 games with at least 20 points ... Grabbed double-digit rebounds 21 times ... Recorded 20 double-doubles ... Notched more double-doubles (19) off the bench than any other player ... Ranked seventh among reserves in scoring ... Ranked 15th in the league in rebounds per game ... Recorded more rebounds per game than any other NBA reserve ... Ranked second in offensive rebounds per game among reserves ... Top Single Game Performances: Recorded a double-double in the season opener with 19 points (7-12 FG, 1-2 3pt, 4-6 FT) and 11 rebounds in a win vs. Minnesota (10/26/16) ... Posted a double-double with 12 points (5-16 FG, 2-4 FT) and 14 rebounds in 22 minutes, including an eight point and nine rebound fourth quarter in a win vs. Philadelphia (12/6/16) ... Scored a team-high tying 27 points (12-17 FG, 1-1 3pt, 2-2 FT), added 11 rebounds and dished out a season-high six assists in 35 minutes off the bench in a 24-point comefrom-behind OT win at Golden State (1/6/17) ... Totaled 15 points (7-19 FG, 1-1 3pt) and a team and season-high 16 rebounds, including eight offensive boards vs. Chicago (1/15/17) ... Posted 20 points (7-14 FG, 2-3 3pt, 4-5 FT) and 10 boards for his second 20 and 10 game of the year vs. Sacramento (1/20/17) ... Notched team-highs including a season-high 28 points (12-20 FG, 0-1 3pt, 4-4 FT) and nine rebounds in a win at Utah (1/28/17) ... Posted a double-double with 17 points (5-18 FG, 0-2 3pt, 7-8 FT) and 15 boards vs. Sacramento (3/27/17) ... Pulled down 16 rebounds for the second time on the season and totaled 18 points (7-21 FG, 0-3 3pt, 4-6 FT) for another double-double at San Antonio (4/4/17). 2017 Playoffs: Averaged 13.2 ppg (.422 FG%, 1-7 3pt, 8-11 FT), 8.2 rpg, 0.7 apg, 0.8 spg, 0.3 bpg and 31.8 mpg in six games (Four starts) ... Scored in double-figures four times and 20+ points once ... Grabbd 10 or more rebounds in three games ... Recorded three double-doubles ... Top Single-Game Performances: Totaled 18 points (9-18 FG, 0-1 3pt), 10 boards and three steals for his first double-double of the 2017 postseason at SA (4/17/17) ... Followed up his double-double with 21 points (9-16 FG, 1-2 3pt, 2-2 FT) and eight rebounds in a playoff win vs. SA (4/20/17). Averaged 15.3 ppg (.475 FG%, 6-26 3pt, .796 FT%), 7.8 rpg, 2.1 apg, 0.6 spg, 0.2 bpg and 29.6 mpg in 68 games (53 starts) ... As a starter, averaged 15.6 ppg (.467 FG%, 6-23 3pt, .811 FT%), 7.8 rpg, 2.2 apg, 0.6 spg, 0.1 bpg and 30.5 mpg in 53 starts ... As a reserve, averaged 14.1 ppg (.512 FG%, 1-3 3pt, .745 FT%), 7.7 rpg, 1.6 apg, 0.6 spg, 0.4 bpg and 26.7 mpg in 15 games ... Missed a total of 14 games due to injury ... Did not dress in seven games due to a sore right knee (11/20-11/27/15, 3/11/16, 3/16/16) ... Did not play in two games due to a coach’s decision (3/7/16, 3/9/16,) while tending to the same sore right knee ... Not with the team on three occasions due to a sore right knee (3/12/16, 3/14/16, 3/17/16) ... Did not dress in one game due to a right ankle sprain (3/25/16) ... Not with the team for one game due to a right ankle sprain (3/28/16) ... Scored 10+ points 57 times, including 14 games with 20+ points ... Grabbed 10+ rebounds 18 times ... Recorded 17 double-doubles, including one triple-double … Led the Grizzlies in scoring 17 times, in rebounding a team-high 28 times, in assists seven times, in steals eight times, in blocks five times and in minutes 12 times ... Paced the team in rebounding average for the fourth straight season and for the sixth time in his seven seasons in Memphis ... Ranked third in scoring average ... Led the team in total points (1,040), offensive rebounds (179), defensive rebounds (350), total rebounds (529) and field goals made (431) and attempted (907) ... Registered his first career triple-double in his 974th career NBA game, which set the league record for most career games before his first triple-double and broke Karl Malone’s old mark of 860 games… Became the third-oldest player in NBA history at 34 years and 247 days old to record his first triple-double, behind only Matt Barnes (36 years and two days old) and Dennis Rodman (34 years and 248 days old) ... Vaulted to 94th in NBA history in career scoring after he surpassed the 16,000-point plateau and finished the season with 16,693 career regular season points ... Surpassed Randy Smith (101st, 16,262 points), Paul Arizin (100th, 16,266 points), Stephon Marbury (99th, 16,297 points), James Worthy (98th, 16,320 points), Joe Dumars (97th, 16,401 points), Jerry Stackhouse (96th, 16,409 points), and Tiny Archibald (95th, 16481) ... Leaped over Larry Bird (51st, 8974), Johnny Green (50th, 9083), and Artis Gilmore (9,161) to 47th on the NBA’s all-time career rebounds list as he surpassed the 9,000-rebound mark during the season and ended the regular season with a career total of 9,213 rebounds ... Top Single-Game Performances: Recorded 15 points (6-12 FG, 3-4 FT) and eight rebounds as he tapped in the winning put-back with 0.6 seconds left in a home win vs. Portland (11/13/15) ... Scored 26 points (11-18 FG, 4-4 FT) and grabbed a season-high 18 rebounds in 31 minutes off the bench in a win at Portland (1/4/16) ... Posted 24 points (9-19 FG, 6-8 FT), which included 16 in the second half and a season-high three blocks in a win vs. Denver (1/8/16) ... Collected 25 points (8-17 FG, 1-1 3pt, 8-8 FT) and 13 rebounds in a win vs. Boston (1/10/16) ... Notched 26 points (12-19 FG, 2-2 FT), nine rebounds and four assists vs. Portland (2/8/15) ... Recorded his first career triple-double with a season-high 28 points (10-19 FG, 0-1 3pt, 8-8 FT), 11 rebounds and a career-high 10 assists vs. LA Clippers (3/19/16). 2016 Playoffs: Averaged 13.0 ppg (.371 FG%, 6-7 FT), 8.8 rpg, 1.8 apg, 0.3 spg and 29.9 mpg in four games (Four starts) ... Recorded two double-doubles ... Top Single-Game Postseason Performances: Tallied 20 points (9-21 FG, 2-2 FT) and 11 rebounds vs. San Antonio (4/22/16). Averaged 17.4 ppg (.467 FG%, 2-20 3pt, .742 FT%), 10.1 rpg, 2.5 apg, 0.7 spg, 0.3 bpg and 34.2 mpg in 79 games (79 starts) ... Missed three games due to injury/illness ... Missed two games with a toe injury (11/30-12/3/14) ... Did not play in one game due to flu-like symptoms (3/5/14) ... Led the team or tied for the team lead in scoring 33 times, rebounding 57 times, assists eight times, steals eight times, blocks five times and minutes 22 times… Posted 10+ points 74 times, 20+ points 34 times and 30+ points once ... Led the Grizzlies in scoring, rebounding, total points (1,372) and total rebounds (795) which marked the fourth time he led the team in those categories ... Also led the team in total offensive rebounds (265), total defensive rebounds (530), field goals made (560), field goals attempted (1,198), free throws made (250), free throws attempted (337) and total minutes (2,705) ... Grabbed 10+ rebounds 47 times and 20+ rebounds once ... Recorded 47 double-doubles ... Notched 20+ points and 10+ rebounds 27 times ... Tallied 20+ points and 20+ rebounds once ... Had more games with 20+ points, 10+ rebounds and 5+ offensive rebounds (16) than any other NBA player … Passed Pau Gasol (190) as the Grizzlies franchise double-double leader as he finished the season with 210 double-doubles in a Memphis uniform ... Recorded his 400th double-double to become the eighth active player to notch 400 career double-doubles and the fourth quickest among active players to reach 400 behind only Tim Duncan, Dwight Howard and Kevin Garnett and finished the season with 416, which includes postseason games ... Recorded a double-double average for the eighth time in his career ... Set career highs for total assists (200) and assists per game ... Tied for fourth in the NBA in double-doubles with 47, ranked ninth in rebound average, tied for 36th in scoring average and 39th in minutes per game ... One of seven players to average at least 17 ppg and 10 ppg ... Won the Kia NBA Community Assist Award in November 2013, his third time to receive the honor, for his outstanding contributions to the Memphis community ... Top Single-Game Performances: Posted 23 points (10-19 FG, 3-4 FT) and a season-high 20 rebounds, including a season-best 10 offensive boards vs. New Orleans (1/20/14), which marked his 11th career game with 20 points and 20 rebounds ... Scored a season-high and team season-high 32 points (15-25 FG, 2-2 FT) and added nine rebounds to help Memphis clinch a franchise record fourth consecutive playoffs berth with a win at Phoenix (4/14/14) ... Posted 27 points (11-22 FG, 5-6 FT) and 14 rebounds for another double-double in an OT win vs. Dallas (4/16/14). 2014 Playoffs: Averaged 18.2 ppg (.404 FG%, 0-1 3pt, .610 FT%), 8.7 rpg, 2.3 apg, 0.8 spg, 0.2 bpg and 39.1 mpg in six games (Six starts) in Memphis’ opening round series against Oklahoma City ... Missed one game (5/3/14) due to suspension by the NBA after an altercation with Thunder center Steven Adams in the fourth quarter of Game 6 … Scored 10+ points six times and 20+ points three times ... Grabbed 10+ rebounds three times ... Recorded three double-doubles and two 20-10 games ... Top Single-Game Performances: Started the postseason off with a 21-point (7-21 FG, 7-12 FT) and 11-rebound performance at Oklahoma City (4/19/14) ... Recorded 25 points (10-20 FG, 5-6 FT) and six rebounds in a win at Oklahoma City (4/21/14). Selected to the NBA All-Star Team for the second time in his career, becoming the first Grizzlies player to make multiple All-Star appearances… Recorded 15.4 points, 11.2 rebounds and 1.4 assists on .460 shooting in 34.3 minutes in 76 games (75 starts) in his fourth season in Memphis and 12th in the NBA… Led the NBA in total offensive rebounds (310) for the second time in his career (2009-10) and tallied the third-highest number of offensive boards in his career… Ranked fourth in the league in doubledoubles (45)… Tied for fourth in the league in rebounding and was one of three qualifying players to average at least 15 points and 11 rebounds per game (Dwight Howard, David Lee)… Averaged a double-double for the seventh time in his career and seventh time in the last 10 seasons… Recorded six points and five rebounds in 13 minutes in the 2013 NBA All-Star Game on Feb. 17 at the Toyota Center in Houston… Exploded for a season-high 38 points and season-best 22 rebounds in 44 minutes in an overtime win over Phoenix on Dec. 4, his fourth career 30-20 game and third in a Grizzlies uniform… Became one of four players in NBA history to post at least 38 points and 22 boards against Phoenix, joining Wilt Chamberlain, Kareem Abdul-Jabbar and Bob Lanier… Shot 15-of-22 from the field and 8-of-8 from the free throw line in his performance against the Suns… Poured in 25 points and 19 rebounds in the regular season finale on April 17 vs. Utah… Hauled in 10 offensive rebounds on Jan. 14 vs. LA Clippers and March 15 at Denver, his eighth and ninth career games, respectively, with double-digit offensive boards… Recorded more than 10 points and more than 10 rebounds in all of the first 11 games of the season, becoming just the third player in the last 32 seasons to do so, joining Shaquille O’Neal (1992-93) and Kevin Love (2011-12)… His 11-game double-double streak to start the season was the longest double-double streak by any NBA player this season… Recorded a season-high six assists on Nov. 28 vs. Toronto… Scored 10-plus points 66 times, 20-plus points 13 times and 30-plus points once… Grabbed 10-plus rebounds 48 times and 20-plus rebounds once… Posted 45 double-doubles… Recorded 10 games with at least 20 points and 10 rebounds… DNP (Coach’s Decision) on Jan. 18 vs. Sacramento while resting a strained lower back… Not with team on Jan. 4 vs. Portland due to flu-like symptoms… Missed four games from March 3-9 due to a left ankle sprain… 2013 Playoffs: Led the team in in scoring (17.4 points) and rebounding (10.0)… Ranked T-15th in the league in scoring and seventh in rebounding during the postseason… Averaged 11.0 points and 12.0 rebounds on .302 shooting in 38.5 minutes in the Western Conference Finals against San Antonio… Averaged 18.4 points, 10.8 rebounds and 2.2 assists on .446 shooting in 39.6 minutes during the Western Conference Semifinals against Oklahoma City… Averaged 20.8 points and 8.0 rebounds on .568 shooting in 33.7 minutes in the first round against the Los Angeles Clippers. Made his postseason debut, logging one minute in Game 1 of a first-round matchup with the Los Angeles Lakers on April 21, 2002. In his lone season at Michigan State University (2000-01), averaged 10.8 points, 6.7 rebounds and 1.0 assists on .587 shooting in 19.8 minutes in 33 minutes as a key reserve on the Spartans’ 2001 NCAA Final Four squad… Earned Freshman All-American honors from The Sporting News… Ranked third in the Big Ten in field goal percentage and ninth in rebounding… Scored a career-high 27 points on Dec. 6, 2000 vs. Florida… Posted a career-high 14 rebounds in the NCAA Elite Eight on March 25, 2011 vs. Temple. 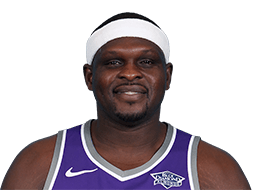 Born July 16, 1981 in Marion, Ind… Full name is Zachary Randolph… Nickname is “Z-Bo,” a reference to the Friday movie franchise… Son of Mae Randolph… Has one brother, Roger… Has two sisters, Tomika and Kelly… Has two daughters, MacKenley and MaZiya… Attended Marion High School in Marion, Ind., where he earned USA Today and Parade First Team All-American honors as a senior in 2000… Named Most Valuable Player of the 2000 McDonald’s All-American game… Guided Marion to the 2000 Class 4A State Championship… Named 2000 Indiana Player of the Year by USA Today… Member of the silver medalist U.S. Team at the 2000 World Championship for Young Men… Extremely active in the Memphis community… An advocate for pit bulls, assisted in the rescue of a pit bull that was trapped in a drainage pipe in Memphis in July 2012… Teamed with Tia Torres of Animal Planet’s “Pit Bulls & Parolees,” of which he is a fan, to help the troubled dog receive long-term care, financing the entire rescue, rehabilitation and adoption processes for the dog, named “Little Z-Bo”… Received the Kia NBA Cares Community Assist Award in December 2010 in recognition to his outstanding efforts in the community… Affectionately known as “Z-Bo Claus” during the holiday season for his philanthropic work in the Memphis community, has funded utility payments for 100 families in need during the holidays for three-straight years… Took 100 children from the Boys and Girls Club of Greater Memphis on a holiday shopping spree at Sam’s Club in December 2010, providing each child with a $100 gift card…Co-hosted the 2012 Staxtacular event, his third consecutive year hosting the fundraiser benefiting the Stax Music Academy… Appeared on “MTV Cribs” in January 2006… Met Nelson Mandela as part of NBA’s “Basketball Without Borders” event in Johannesburg, South Africa in September 2004… Favorite basketball player growing up was Michael Jordan.